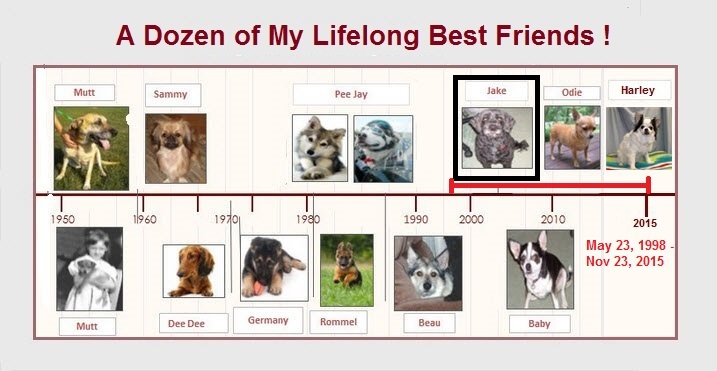 To once again borrow a few words from my good friends at Google, “the loyalty, affection, and exploits”of my dogs throughout my years on this earth have inspired a rich body of true, sometimes hilarious and sometimes sad stories that have only added to my life events. 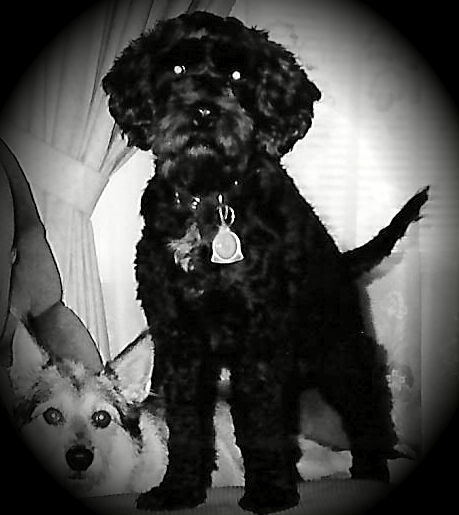 And today, unfortunately, it is with heavy hearts that we said goodbye to Jake, our 17-1/2 year old Cockapoo. Jake came to us from Fredericksburg, Virginia, which is where many of my Boling ancestors dating back several generations lived. We were on a mission to find a replacement dog for my mom, who was celebrating her 71st birthday back in August of 1998. We picked a rust colored pup for mom, which she named, of course, “Rusty.” The breeders lived on a farm and they also raised bullmastiffs. I noticed there were two other 8-week old pups from their first cockapoo litter that were playing in and around the yard. A solid black one, was trying to eat water from a hose after just visiting the large mastiffs in their cages. He came running and jumped up on my legs and gave me a very warm greeting. And, this is when our love for each other began. What else could I do, we left Fredericksburg that day with two pups. One, we had chosen for mom, and the other, who chose me. Over our nearly 18 years together, Lord Jacob of Calvert, “Jake,” as we called him, gave us much joy, many laughs, and in his recent years had presented us with way too many unwelcomed presents. This picture was taken in 1999. Jake was about one year old. His buddy next to him was “Beau.” Beau was with us when we purchased Jake–and Beau was less than a happy camper that day, riding in the back seat of a car with two eight week old pups. But, they soon became fast friends and remained so for five years. Beau passed due to cancer in the summer of 2003. He had been with us for 12 years. In the summertime, our extended families and their children came over on the weekends to swim in our pool. We always put out a big spread and we reminded everyone about Jake’s main interest–food! Even the breeders advised us that he never could get enough food and that he was a glutton. On this one weekend, we had freshly prepared deviled eggs waiting for the swimmers to come inside to eat. Everyone was usually aware all chairs were to remain pushed into the table, especially if there was food on it. On this one occasion, though, someone forgot–and that was Jake’s opportunity. While the cooks went outside to call in the swimmers, Jake used the chair to climb up on the table. When we opened the door from outside all we could see was Jake on all fours standing atop a once filled platter of freshly made deviled eggs–that “little stinker”–he quickly he had eaten all 18 of them! All we could do was laugh and keep Jake at a distance. Other fond memories were when we took Jake, who already had began to show his age, down to North Beach’s boardwalk. Three years ago, we went and spent the entire day there with Jake and us sitting under a shade tree and enjoying the people and events of the first ever Dragon Boat Races that were sponsored by Calvert’s End Hunger Program. We also took Jake with our chihuahuas two years ago this winter to Petersburg, Virginia, as we did more genealogical research within the Boling family’s stomping grounds and historical places. Jake loved riding in the car and this was probably his longest ride and day long event ever. We left at 6 a.m. in the morning and didn’t return home until nearly midnight. To honor Jake on his last day today, we fed him Porterhouse Steak, which, still true to form, he gobbled up. Despite his poor health–his appetite never went. Jake lost one third of his body weight over this past year, he lost his left eye to disease two years ago, about that same time his hearing started going, and two weeks ago the doc told us his calculated age was 88 and that the noises that he had recently started making were probably due to dementia. We had so hoped that the old man would just pass quietly in his sleep, but he reminded us of his early pup days when he was a fighter playing with the streaming water from a hose (something his firefighting dad probably fully understands), and the giant bullmastiffs that were probably 10 times his size. We must also give thanks today to Calvert Animal Hospital for all their years of helping us care for Jake and for making his and our last day together today as painless as possible. We will never forget or stop loving our old man, Jake, may he rest in peace. And, I so pray that doggie heaven is a part of man’s too. Because our dogs have always been our best friends and will always be a part of our family.